Welcome to Week 47 of Year 4 at PPF! Random.org this week chose #77 - Connie Powell. 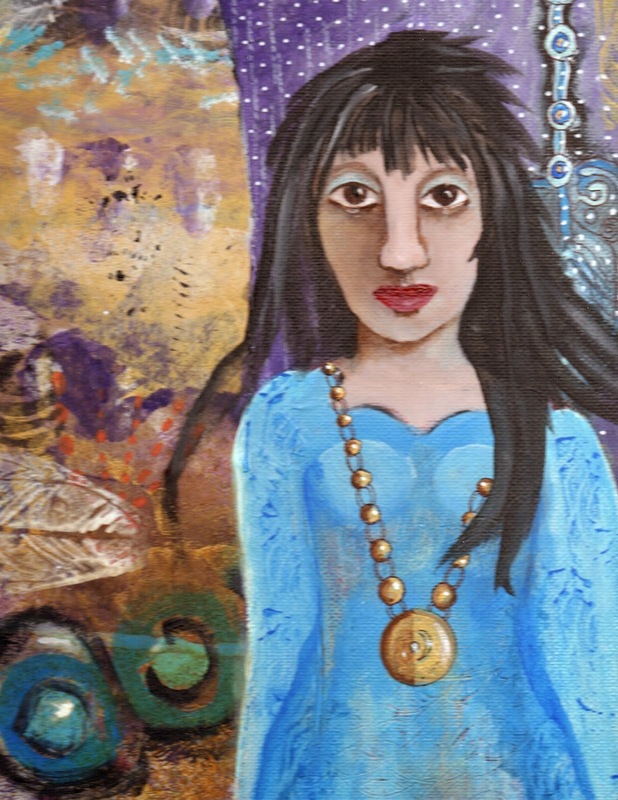 Connie created this haunting and beautiful mixed media lady first with using papers she made herself and then painting on top of that lovely background. She was very inspired by "We'Moon" which she explains in more detail on her blog. Check it out! Hi Everyone. I am back at least for now. Love Connie's piece. Happy Friday, everyone! Love the colors in Connie's work. Great art as always here! Happy PPF! New to the group and am enjoying all the comments on my work. Connie, very creative piece. Love that your creating our own paper, that's something I enjoy doing too. I love the hair Connie has created, there's power in that growth!! Vitality in the girl. Lovely painting with all those layers of colour. wonderfully vibrant painting by Connie! Happy PPF everyone! OMG! What an awesome surprise! Thanks for featuring my artwork! Connie shows beautiful work! Happy PPF all! A hauntingly beautiful piece of artwork by Connie! She has beautiful eyes! Happy PPF! Wonderful piece & incredible detail work in the paper craft!